“Five years away from the 2015 target date for achieving the Millennium Development Goals, it is more important than ever to encourage young people to dedicate themselves to achieving a more just and sustainable world,” wrote Irina Bokova, director-general of UNESCO, as she launched the International Year of Youth (August 2010–August 2011) and International Youth Day (12 August). 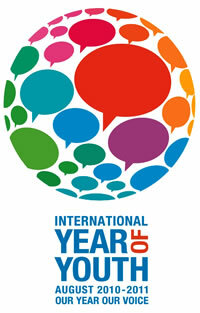 Proclaimed in December 2009 by the UN General Assembly, the international year puts the accent on dialogue and mutual understanding. It aims to promote the ideals of peace, respect for human rights and solidarity between generations, cultures, religions, and civilizations. The Year turned out to be more revolutionary than expected. At the beginning of 2011, young people rose up in Tunisia and then in Egypt, and the movement spread to other countries in the region, also rousing countries in Europe such as Spain. Elsewhere in the world, youth are mobilizing for a range of causes, as varied as the means they use. Much more involved than we tend to think, young people have decided to take things into their own hands. And in the July-Sept. 2011 issue of the UNESCO Courier, it is the youth who are speaking out, expressing their concerns and explaining their actions.